The Kings celebrate a first-period goal by Marian Gaborik against the Oilers. The Los Angeles Kings needed to shed some rust heading into the playoffs and the Edmonton Oilers proved to be a perfect solution. Marian Gaborik had two goals and an assist and Martin Jones made just 17 saves for his fourth shutout of the season as the Kings snapped a three-game losing skid with a 3-0 victory over the Oilers on Thursday night. "After coming off a bad start (Wednesday) night we talked about having to be ready to play from the start and we did," Gaborik said. "We got up 1-0 quickly and that for sure helped us. I thought we controlled the game all 60 minutes." Anze Kopitar also scored for the Kings, who had won just once in their previous five games. "We wanted to have a good start and obviously scoring in the first minute helps," Kopitar said of his goal just 27 seconds in. "After that, we were pressing pretty hard and had some pretty good offensive zone time and brought the game home pretty well with no stress in the end and that’s what you want. "Right now we just want to sharpen our game for pretty much a week from now so we’re ready to go in the playoffs." Los Angeles has already clinched third in the Pacific Division and will play the second-place San Jose Sharks in the first round of the playoffs. The Oilers have lost two in a row and have now been shut out 10 times this season — including seven times at home. "Tonight was a really disappointing effort on all fronts except for goaltending," Oilers forward Taylor Hall said. "By no means is a good effort in our last game going to make up for the 82 games that we have played, but it would certainly be better than going out on a bad note. If we had to leave the season after a game like tonight’s, that would leave a bit of a sting." The loss dropped Edmonton into 29th place in the NHL, a point back of Florida, which beat Toronto earlier in the night. "It is a bit of a wakeup call," Oilers forward David Perron said of the shutout loss. "Everyone was happy with the way we had been playing over the last few games and it is a reminder that there is a lot of work to be done." It didn’t take the Kings long to start the scoring, going up 1-0 on the game’s first shot 27 seconds into the first period. Justin Williams threw a pass in front of the Oilers’ net and it hit the stick of a defender before ending up in front for Kopitar, who sent his 200th career NHL goal past goalie Viktor Fasth. "You can’t give a Stanley Cup contender a lead that early," Oilers coach Dallas Eakins said. "Our top line was on the ice and it was a really easy assignment there and it was in our net. That can’t happen." The Kings went up by two 9 minutes into the opening period as Willie Mitchell flubbed a shot from the point, but it ended up right on the stick of Gaborik, who beat Fasth for his 10th goal of the season in his 40th game. Los Angeles almost padded its lead with 3 minutes left in the first, but Jarret Stoll’s power-play shot clanged off the post. The Kings had 11 first-period shots, while Edmonton only managed four on Jones. Edmonton had its first real scoring chance of the game minutes into the second period when David Perron circled the net and had Jones going the wrong way, but the Kings’ goalie recovered in time to make a huge diving save on Hall. Los Angeles got a gift goal with 6 minutes to play in the second period as Gaborik took a wrist shot just across the blue line that Fasth only got a piece of before it caromed into the net. It appeared that Gaborik had his hat trick on a power play with 6 minutes to play in the third, however, the goal was disallowed due to goaltender interference by Williams. The Kings outshot Edmonton 48-17 in the game and 23-3 in the third period. NOTES: It was the final of four meetings between the Oilers and Kings this season. Los Angeles won the first three games with a combined score of 9-3 while outshooting Edmonton 136-69. … The Kings have beaten the Oilers six straight times and 12 of the last 15 meetings. … Gaborik now has at least a point in eight of his last nine games. 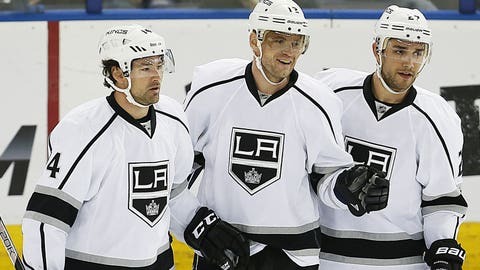 … The Kings were without D Robyn Regehr (undisclosed) and D Drew Doughty (upper body). Both are listed as day-to-day. … Edmonton has a number of players who are done for the season in D Andrew Ference (pectoral tear) and forwards Boyd Gordon (shoulder), Nail Yakupov (broken ankle), Jesse Joensuu (high ankle sprain), Ryan Jones (torn PCL) and Luke Gazdic (shoulder). … Oilers forward Sam Gagner left the game favoring his ankle after an awkward collision into the boards midway through the second period and did not return.